More community science came out at the Festival Science Café on Tuesday, where the audience – as usual– joined in the fun by giving our three speakers some testing and intriguing questions. Everyone went away informed about the latest research on pain, viruses and exactly why you might want to weigh a cloud – and all appreciated the dedication of one speaker, Dr Jim McQuaid from the University of Leeds, who came to speak despite recently breaking a leg. The Festival continues with a science-themed Film Club on Thursday, where you can see The Shape of Water, in which strange scientific experiments give rise to an unearthly love affair. Friday has the Science Lunch, where you can find out from physicist Peter Hine about how to make new materials over a delicious buffet lunch – but please make sure you book your ticket in advance, or you might not get any food! And Saturday sees not only the annual free family Science Fair at the Courthouse, but also a chance to find out about Bakineering in Space with 2016 Bake-Off finalist and engineer, Andrew Smyth. 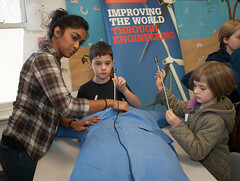 The Science Fair runs from 10-4 at the Courthouse and there’s lots to do for all ages, with stalls and activities from science groups across the region. You can come along and talk to engineers, biologists, doctors, physicists ornithologists and many many more. Andrew Smyth’s talk starts at 7.30 and is suitable for everyone over the age of 7 – especially those who like bakes! 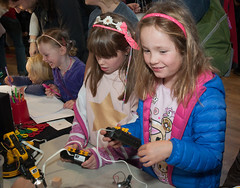 More information and tickets are available at the Science Festival website (https://otleysciencefestival.co.uk) or from Otley Courthouse (tel: 01943 467466). If you’ve been enjoying the Great British Bake-Off this year, you can carry on the fun after the final episode by joining 2019 finalist Andrew Smyth at Otley Courthouse next Saturday for his engineering and baking show, “Bakineering in Space”. Andrew wowed audiences when he was on Bake-Off with cleverly constructed cake marvels, but he’s also an engineer and finds amazing links between science and sweet treats. He’s come to Otley to talk about the connections between cake and space engineering. How does a retro dessert explain how astronauts return safely from orbit? What does molten sugar have to do with keeping safe from micro-meteorites? And can we eat any of it? Expect out-of-this-world baking and awesome engineering in this family show at the Courthouse at 7.30 on Saturday 10 November. There’s also eating involved at the regular Science Lunch, where a relaxed talk and questions follows a delicious buffet lunch. This year Peter Hine of the University of Leeds talks about how useful modern materials develop from ideas thought up in the laboratory into everyday products you can buy. He’s behind a new material that’s now providing smart, tough and lightweight luggage for Samsonite – and tells the story here. This is your chance to quiz a physicist about the tricky physics of designing new materials. He’s speaking at the Courthouse at 12.30 on Friday 9 November and you need to buy a ticket in advance. Marty Jopson, of BBC’s The One Show, is returning with a new family show this year, examining the weird world of the super-small. His “Invisible Worlds: a microscopic safari” show on Monday 5 November will have more surprises than your average firework display, as Marty tackles tiny things, made large on screen. He’ll show you hugely magnified insects, plants and even bacteria, using interactive demonstrations and even samples from the audience – you have been warned! Marty will be having it large at the Courthouse at 7.30 on Monday 5 November. 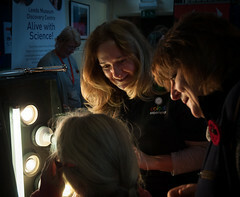 The Science Festival runs from 5 – 10 November at Otley Courthouse, with a Science Café, talks, a science-themed film from the Film Club (The Shape of Water) and, on Saturday 10 November, the free family Science Fair at the Courthouse from 10–4. 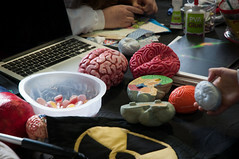 Find out more at the Otley Science Festival website (https://otleysciencefestival.co.uk/festival/) and buy tickets at the Courthouse, in person, by phone (01943 467466) or online (https://otleycourthouse.org.uk). Remember, remember, the seventh of November! Yes, on 7 November 2018, Otley Courthouse will host a spectacular Science Festival show from internationally-recognized pyrotechnician Matthew Tosh. If you want to know how firework displays get their colours, sound effects and perfectly timed bursts, then this is the show for you. This family show (aged 7 and upwards) will bring to life the sights, sounds and smells of fireworks, right there in front of the audience, in a magical and explosive demonstration of pyrotechnic science. 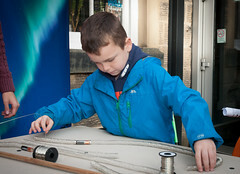 Matthew will bring his fascination with how things work to the Otley Science Festival as he demonstrates how science, technology, engineering and mathematics ensure that displays are spectacular, accurate and safe for the public. What better way to celebrate the bonfire season? But if baking is more your thing, come to the Courthouse on the evening of Saturday 10 November to listen to 2016 Great British Bake-Off Finalist Andrew Smyth. Andrew is an engineer and the show he is bringing to Otley Science Festival, Bakineering in Space, examines the surprising links between cake and everything it takes to keep astronauts safe in space. Andrew engineered some amazing creations on GBBO and now he reaches new heights – right into orbit – in this combination of technology and tortes. Come along to be inspired, informed and, quite possibly, fed! And these talks are only part of what the Science Festival has to offer. There will also be the regular Science Café, where three speakers from the region’s universities have ten minutes to talk about their work before you, the audience, take the floor with your questions. All ages are welcome. And Friday 9 November offers the opportunity to find out about how to build a better suitcase, at the regular Science Lunch. If you want to find out how innovative new materials are discovered, designed and developed into consumer products, then buy your ticket in advance and come along to the Courthouse. There’s also a new show from Marty Jopson, getting up close and personal in a microscopic safari, Alice Roberts talking about how domestication of animals changed them – and us – and, as ever, the free family Science Fair at the Courthouse from 10–4 on Saturday 10 November. There’s also the regular Science Café on Tuesday 6 November, and our popular Science Lunch on Friday 9 November (advance purchase tickets only). Here you can enjoy a delicious buffet lunch then listen to our speaker Dr Peter Hine of the University of Leeds talk about how physicists develop new materials. He’s a polymer physicist who developed a new material with the elusive combination of lightness, rigidity and strength, which – eventually – found a use in Samsonite suitcases. His account of the ups and downs of discovery and development features inspiration and perspiration – as well as quite a bit of luck. Tickets available from Otley Courthouse. Remember, remember the Fifth of November – that’s when Otley Science Festival 2018 gets started! If you want to find out how fireworks sparkle, what dogs get out of being pets and what baking has to do with astronauts, then come along to Otley Science Festival from 5–10 November and find out. There’s something for everyone in this annual science celebration at Otley Courthouse and tickets are already selling fast. Otley’s own Marty Jopson, fresh from BBC TV’s The One Show, will be going on a live microscopic safari – with audience participation – in his family show on Monday 5 November at 7.30. And on Wednesday 7 November you can find out how science makes fireworks fantastic, with internationally recognized pyrotechnician Matthew Tosh. A quieter time can be had on Friday 9 November with Alice Roberts, who will be talking about how dogs, cattle and horses became part of the human family – and what that meant for us as well as for them. And on Saturday evening, you can come along and find out what happens when engineering and baking collide with Andrew Smyth. Andrew wowed us all by bringing engineering into The Great British Bake-Off and now he’s bringing Bakineering to Otley. 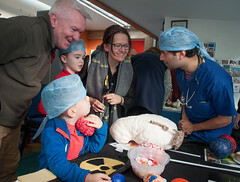 There’s also science for the under-fives at Silly Science on 5 November, for everyone at the Festival Science Café on 6 November and for hungry people interested in new materials and how they become suitcases at the Science Lunch on 9 November. And, last but by no means least, on Saturday 10 November the Courthouse is taken over by the free family Science Fair, with science surprises and technology twists for everyone, supplied by the region’s universities and organisations. The next Science Café comes to Otley Courthouse on Thursday 20 September with a mix of intrepid engineering, smart-but-friendly cities and the psychology of behaviour in prison. The Café takes place at 7.30 and all are welcome – especially people who want to ask questions of our three speakers. Smart cities are the coming thing, with big data benefits for traffic management for example. But how do people fit in? Alison Heppenstall of the University of Leeds will be talking about humanising smart cities for a better future. Danielle McDermott of Leeds Trinity University will consider the behaviour of people in prison and out and how psychologists decide which prisoners to release. And, in a change to the advertised programme, BBC The One Show’s Marty Jopson will be talking about the trials and tribulations of filming at Emley Moor mast, with an overview of the role and origin of the mast itself. Everyone aged from 8 to 80 – or thereabouts – is welcome to this relaxed and social science catch-up. Bring your inquiring mind and expect to be informed and entertained! 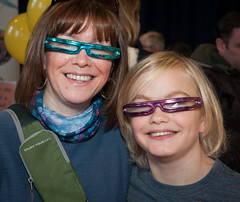 The tenth annual Otley Science Festival runs from 6–11 November and tickets are selling fast. If you want to come and see Otley’s own Marty Jopson live – away from his usual habitat of BBC TV’s The One Show, you need to buy your tickets soon. Marty will be talking about “Dangerous Equations” in his popular family show on Friday 10 November. It is suitable for 11-year-olds upwards and features Mr Spikey and the Pendulum of Doom, not to mention the possibility of burns and broken bones – but only for the presenter, not the audience. Probably! Alongside Marty’s show, you can also spend an Evening with a Space Scientist and find out about Monica Grady’s fascination with meteorites, comets and thing that may well go bump in the night. She will be speaking and answering your questions at the Courthouse on the evening of Saturday 11 November. And if the future of the human race is your thing, come along on Tuesday 7 November to hear Robert Winston’s take on “Modifying Humans – Where does genetics stop?” Rashik Parmar, IBM’s Technical Executive for Europe will be looking into the future of technology at the ever popular Science Lunch on Friday 10 November. You get a delicious buffet lunch and a talk to ponder – but you do need to buy your tickets in advance. We even have a cracking science –themed film at the Film Club on Thursday 9 November: Hidden Figures. Come along to watch this inspiring Hollywood take on the women who helped NASA reach the Moon – then join us in a local pub afterwards to talk about the film and the book from which it came. 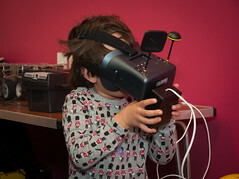 There’s a great family show about digestion from BBC Gastronaut Stefan Gates on Monday 6 November at 7.30: The Utterly Revolting Science Show, which lives up to its name with gut-wrenching – literally – videos and a fart machine, for age seven and upwards, and their parents with strong stomachs. And the Festival Science Café on Wednesday 8 November has a community theme, looking at different ways science is becoming part of our everyday lives. Do you expect to find caffeine when you stop for a coffee, linalool lurking by the soap or theobromine when you pop in for a chocolate bar? These are the chemical compounds responsible for a lot of the tastes, smells and colours of everyday life; for the next few weeks you will be able to find models of the molecules responsible in 15 shops and businesses all over Otley. These chemical clues form the Otley Molecule Trail, a scientific treasure hunt with prizes organised as part of the Tenth Otley Science Festival. We are asking you to search the shops of Otley for models of these and other organic molecules – and you could win a Molymod molecular modeling kit of your very own! Otley Molecule Trail runs from 23 October to 9 November and you can pick up a trail leaflet from Otley Courthouse, Otley Library and the CORE. All you need to do is write down where you find each of the 15 molecules shown in the leaflet, hand in your answers at the Courthouse by 6pm on Thursday 9 November, then see if we draw your name at 11am at the Science Fair at Otley Courthouse on Saturday 11 November. The Molecule Trail is part of the celebrations for the Tenth Annual Otley Science Fair; as well as the usual free family Science Fair on Saturday 11 November, you can come along to talks by Stefan Gates, Robert Winston, Monica Grady and Otley’s very own Marty Jopson (from BBV TV’s The One Show), quiz researchers in the Science Café, have cutting edge technology with your Science Lunch of Friday 10 November or watch ‘Hidden Figures” at the Film Club – then discuss the film and the book it is based on afterwards at the pub. 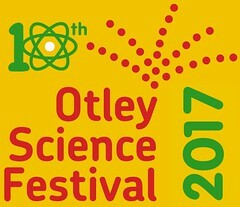 10 years and counting for Otley Science Festival! A national reputation means that some great speakers will now be coming to Otley for the Festival week 6–11 November. 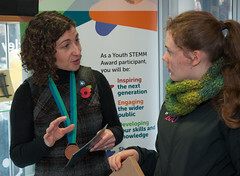 At this year’s Festival, you can listen to Robert Winston on modifying humans and how genetics could shape our future society on Tuesday 7 November, and hear Monica Grady on Saturday 11 November talk about her career in space science, including the Rosetta mission that landed on a comet. If technology is your thing, come along to the Science Lunch on Friday 10 November, where Rashik Parmar MBE from IBM will be looking forward through five life-changing technologies. Younger science buffs might enjoy Gastronaut Stefan Gates’ Utterly Revolting Science Show, a high tech and mind-blowing – but solidly scientific – journey through your digestive system, on Monday 6 November. And this year Marty Jopson will be tangling with some serious sums in his family show Dangerous Equations, on Friday 10 November. And there’s fun for the very young at Silly Science Toddler Time, free-form discussion with three science speakers at the Science Café and a Film Society showing of Hidden Figures, the film that brought NASA’s gifted women in the spotlight, more than half a century after they were a vital part of the US space programme. Come to Otley Courthouse for a science-packed evening at 7.30 on Thursday 14 September, when three speakers from the region’s universities will discuss their work. Topics at this Café include whether your mobile phone will soon be obsolete, what we could do about air pollution and where we, as humans, came from. Please come along and welcome Dr Des McLernon from the University of Leeds, Prof. Mike Pilling from the University of Leeds and Prof. Martin Richards fomr the University of Huddersfield. They will be there to talk but especially to discuss ideas with the audience and answer those all-important questions. At Otley Science Café, the audience are a major part of the evening. Our three speakers each talk for fifteen minutes or so, then we hand the floor over to you the audience for questions. It’s an evening for everybody from nine to ninety, or thereabouts. It’s an entertaining and sociable way to find out about frontline research in the region’s universities.